As you may know, I am a sucker for a good history throwback and seeing how much we have changed and evolved from back then. Come the holidays, we always start to spend as much quality time as possible with loved ones, especially in the kitchen preparing the mouth-watering lunch and dinner for all. This year round made me really think about what it was like when my mother was me helping her mother prepare the delicious feast and what sort of appliances and cooking utensils they used. Upon my conversation while cooking with my mother about what it was like back in the day really got me interested in doing some research and WOW, did the results just become the most interesting find yet?! While the traditional pavlova recipe or nana’s special fruit cake recipe remains, the appliances they used to use to whip these up have majorly shown such a difference when comparing what we use today VS. what our loved ones used when they were little. 1. 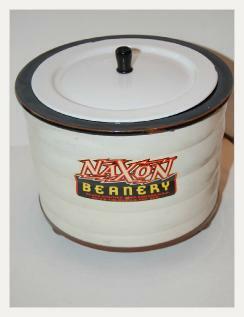 The Naxon Beanery – This was every households necessity (no, seriously – this appliance was the bee’s knees, so versatile and easy!) We know this to be the “Crock-Pot” this was developed by Irving Naxon as a means of recreating his Grandmothers bean soup, the Beanery was transformed into a more versatile status appliance which was then seen overall as a slow cooker. In 1971, the Chicago-based manufacturer was bought out Rival, who renamed the plug-in pot the Crock-Pot. 2. 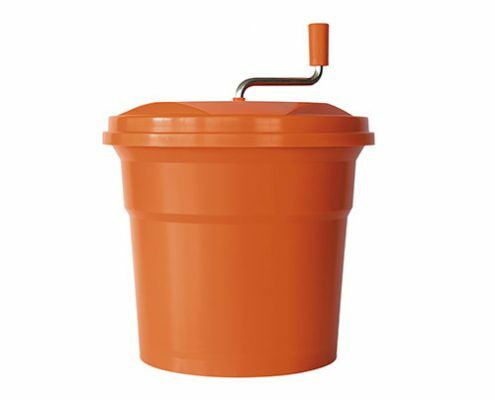 The Salad Spinner – As you may have already noticed that you still have one of these in your cupboard and it isn’t quite an out-dated utensil – this one is still such a great invention, my mother advised that this would come in pastel/fanta colours and pastel greens and it would be her or her siblings job to sit on the floor and spin the handle like mad until the lettuce was dry. Not only were the colours fun but also it did resemble a toy as such which made it easier to convince the kids to help out! 3. 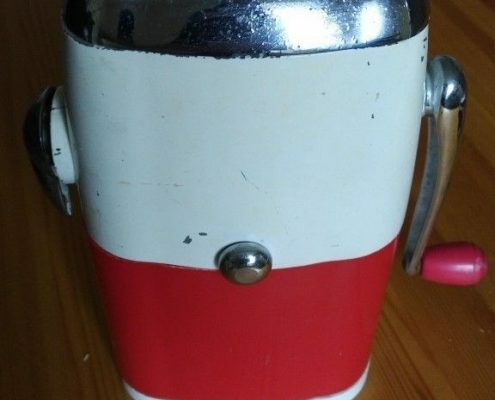 The Ice Crusher – It’s no secret that cocktails where all the rave and at its peak in the 1950s. Here, we have the handiest device that would crush your ice cubes to make a lovely, cool & refreshing slushy-like beverage. 5. 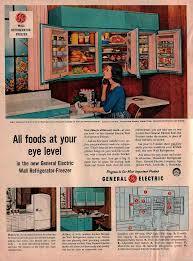 Elevated Cabinet Fridge – Wait, did you say HANGING FRIDGE? Another design I’m totally in love with for what it used to be, I think this design was a very practical idea to have all food being incorporated into the layout of cabinets opposed to free-standing, you’d have to have some strong screws in there to hold it up! 6. 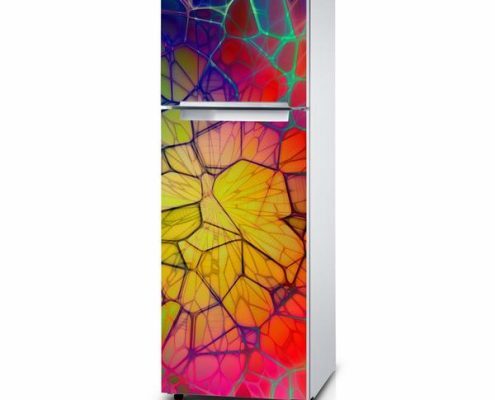 Fridge Wraps – Ever looked at a white fridge and thought “You look a wee bit plain, lets spruce you up!) well, our family living in the older generation hit the nail on the head with a range of patterned designs to stick on the doors of your fridge, retro right?! 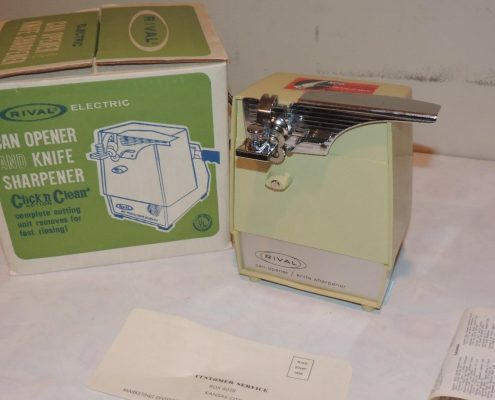 The list goes on & on & on for so many cool, older style appliances and even cooking utensils. It really does amaze me of how much we have evolved into what we use today and the style of things, hearing about my mothers childhood cooking stories and all the different things you don’t see so much anymore is truly eye opening so i hope you enjoy this post and it takes you or your elders back in time to reminisce. *All photos are NOT owned by Next Edition Kitchens.